PRINCETON, N.J. -- Republicans with higher levels of education are more likely than those in their parties with less education to say that the seriousness of global warming is "generally exaggerated." 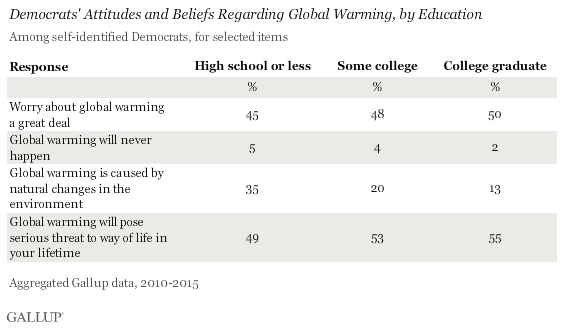 By contrast, Democrats with some college or more are less likely than those with less education to believe the seriousness of global warming is exaggerated. Seventy-four percent of Republicans with a college degree say it is exaggerated, compared with 57% of those with high school education or less saying the same. Democrats are much less likely in general to say that the seriousness of global warming is exaggerated, but those a college degree (15%) are significantly less likely to say this than those with a high school education or less (27%). 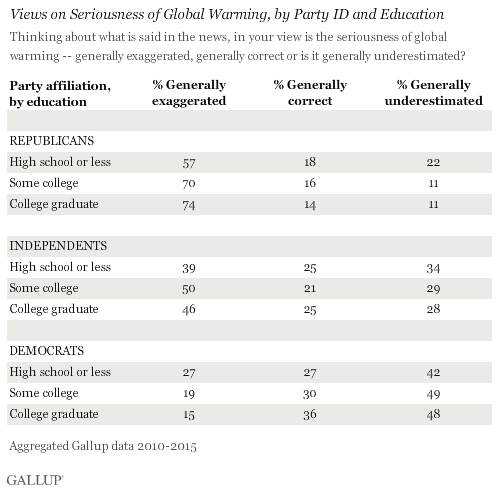 The relationship between education and views of global warming among independents is generally similar to that shown among Republicans. These opposing trends by party suggest that higher levels of education reinforce core partisan positions; in this case, Republicans' strong tendency to question or deny global warming and Democrats' inclination to affirm it. The trends also suggest that partisanship rather than education is a main lens through which Americans view global warming and its effects, particularly for those who claim allegiance to one of the two major political parties. These results come from an aggregation of more than 6,000 interviews conducted as part of Gallup's annual Environmental Poll conducted each March from 2010 to 2015. Over that time, Americans' views about the seriousness of global warming have been steady: 43% on average have said it was generally exaggerated, 24% generally correct and 31% have said it was generally underestimated. Longer term, though, Republicans' and Democrats' views about global warming have increasingly diverged. The tendency for Republicans with college education to be skeptical of global warming is evident in other Gallup trends. For example, although Republicans tend to be much less likely to worry about global warming than others, Republicans with a college degree are even less likely to worry about global warming "a great deal" than their fellow Republicans. Republicans with more education are also about half as likely as those with a high school education or less to say global warming will pose a serious threat in their lifetime, more likely to say that global warming's effects will never occur, and more likely to say that global warming is caused by natural changes in the environment rather than by human activity. The relationship between education and views on global warming among Democrats is in the opposite direction: The most educated Democrats are slightly more likely than less educated Democrats to worry about global warming and to believe it will be a threat in their lifetime. Highly educated Democrats are also much less likely to believe that global warming is the result of natural changes rather than caused by humans. Very few Democrats, regardless of education, say the effects of global warming will never happen. Republicans and Democrats with higher levels of education are both slightly more likely than others in their respective parties to say they understand global warming "very well." The nature of this understanding, however, is obviously quite different between the two groups. 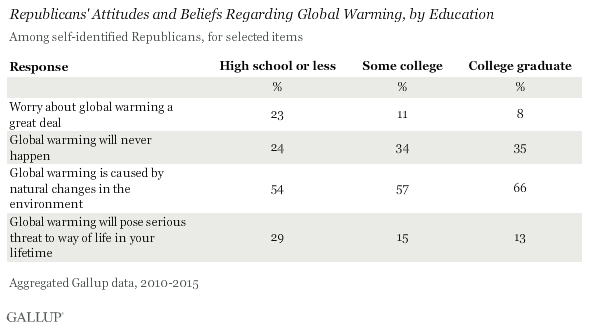 Republicans' views on whether most scientists believe global warming is occurring vary little by education. Republicans are much less likely than Democrats or independents to say that most scientists believe global warming is happening. Education is strongly related to Democrats' views on this question, with highly educated Democrats more likely than those with less education to agree with the statement. Given the scientific nature of global warming, it is not surprising that Americans' understanding and interpretation of its effects could be related to their education levels. Among Republicans and Democrats, education levels have opposite effects, with higher educational attainment linked to more doubt about global warming among Republicans but a greater sense of its reality among Democrats. In other words, education appears to harden the partisan battle lines, rather than build common bridges. College graduates who are Republicans are actually more likely than college graduates who are Democrats to say they understand a great deal about the issue, but well-educated Republicans find this understanding leads them in a different direction than it does Democrats. Partisan affiliation more so than education plays the dominating role in the American public's attitudes about global warming today. Education does not mitigate the partisan divide in beliefs about global warming but instead strengthens it. Results for this Gallup poll are based on telephone interviews conducted in March of each year between 2010-2015, with an aggregated random sample of 6,154 adults, aged 18 and older, living in all 50 U.S. states and the District of Columbia. For results based on the total sample of national adults, the margin of sampling error is ±1 percentage points at the 95% confidence level. All reported margins of sampling error include computed design effects for weighting.